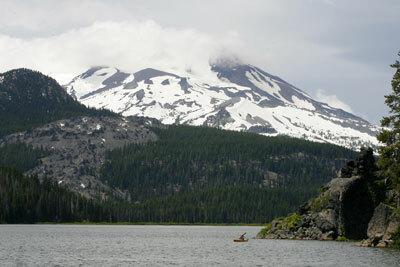 The Cascade Lakes National Scenic Byway near Bend is a great place to tour Central Oregon’s mighty volcanoes. A person could spend a lifetime exploring the wild places of Southwest Oregon and Northern California and never get bored. Between the mountains, rivers and Pacific Coast, there’s no shortage of places to discover. But even the most enthusiastic about our area need a break now and again. And Oregon is, of course, a very large place. One excellent option for those seeking to travel outside the area is the Cascade Lakes National Scenic Byway in the central part of the state. Located just outside Bend, this 66-mile loop through towering volcanoes is one of the state’s most famous roadways. The drive from Grants Pass requires almost four hours — a hefty price to pay in terms of gas money — but there are few places that combine the aesthetic views and opportunities for recreation as this paved paradise. There’s access to the stunning Three Sisters Wilderness and the Deschutes River, Mount Bachelor Ski Resort and 12 different lakes. Everyone from youthful mountaineers to those traveling with a trailer can enjoy this highway. The key is to hit the road and figure out what works. Plenty of resources can help you plan a trip. There are national forest offices in Bend (541-383-5300), Prineville (541-416-6500) and Madras (541-475-9272). A use fee is required at most trailheads and parking lots, so be prepared and consider buying a Northwest Forest Pass. Below, I’ve included three ideas that range from easy to moderate to difficult. The best views directly off the highway can be found from this volcanic lake sitting in the shadow of South Sister (10,358 feet) and Broken Top (9,175). A short trail of about three miles, with a number of different options, surrounds the lake and makes a perfect day-hike for the kids. The first mile is paved and wheelchair accessible. The trail is named for Ray Atkeson, the famed black-and-white photographer who captured images of Oregon’s landscapes in the 1930s and 40s. Atkeson recognized Sparks Lake as a photographer’s paradise, and in walking around the lake, looking out at the tiny islands and the majestic sweep of the two giants looming above, it’s not hard to see why. Another good option is to place a kayak or canoe onto the lake and explore the glassy surface up close. There’s an island that makes a fun spot and other nooks and crannies best explored from the surface of the lake. There’s a campsite at Sparks Lake, but it’s a little close to the highway for my taste. A trip to this volcanic lake is best viewed as an excellent day trip. Among the most popular wilderness trails in the entire state, the Fall Creek to Green Lakes Basin trail runs past idyllic waterfalls and into alpine lakes surrounded by South Sister, Broken Top and Mount Bachelor. The walk begins at the Fall Creek Trailhead and runs gradually uphill on a wide path usually populated by a fair amount of other people. After passing a walled volcanic canyon and several large waterfalls, the trail swings uphill into the Green Lakes Basin, a stunning area of wildflower meadows and gigantic springs directly between Broken Top and South Sister. Tents are allowed in 28 posted, designated sites, which are often full on weekends. The hike is 8.4 miles round- trip and gains 1,100 feet of elevation. Unbelievably gorgeous views highlight a trip up the third-highest mountain in the state. The best part about South Sister is twofold. First, a trail goes all the way to the top, which is rare for a mountain of such height. Second, you don’t have to climb all the way to the summit to enjoy this hike — there’s a wonderful mountain lake that makes a more modest goal. The route begins at Devil’s Lake Trailhead, crosses over the highway and begins climbing up the mountain. The first highlight comes at the 1.5 mile mark, where the trail splits and to the right at heads to the beautiful Moraine Lake, which looks up toward the mountain’s summit. There’s a loop to the Moraine Lake loop that’s 6.5 miles round-trip and gains 2,000 feet — difficult, but not a death march. The trip to the summit is much tougher, obviously, and gains almost 5,000 feet over 5.5 miles. So, a person could spent a lifetime exploring Southwest Oregon and Northern California and never get bored. But for a change of pace, it’s tough to go wrong with the Cascade Lakes National Scenic Byway.